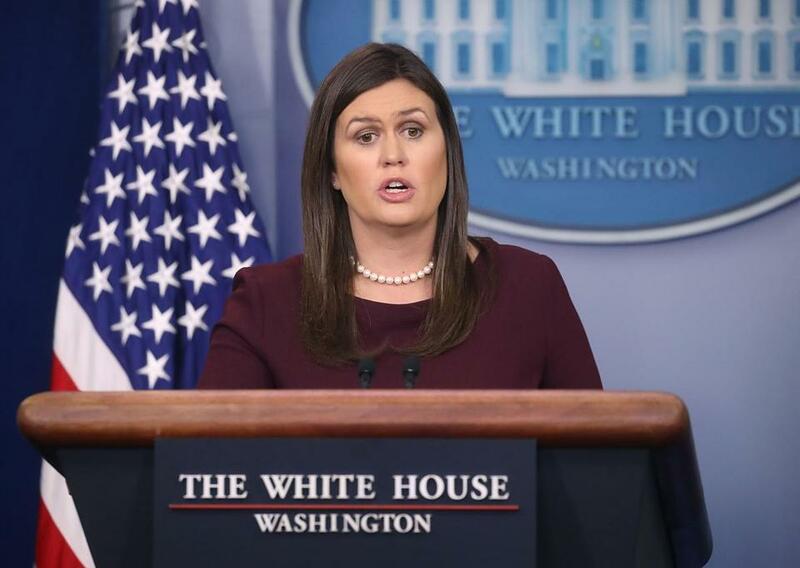 White House spokeswoman Sarah Sanders said she couldn’t guarantee that President Trump has never used the n-word after she was asked to do so by journalists at a White House press briefing. “I can tell you that the president addressed this question directly. I can tell you that I’ve never heard it,” Sanders said before highlighting African American employment numbers. ‘‘I don’t have that word in my vocabulary, and never have,” he wrote. ....such wonderful and powerful things about me - a true Champion of Civil Rights - until she got fired. 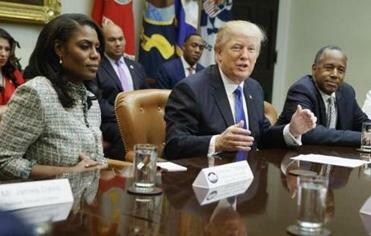 Omarosa had Zero credibility with the Media (they didn?t want interviews) when she worked in the White House. Now that she says bad about me, they will talk to her. Fake News! Manigault Newman made the explosive claim in a forthcoming book and later told NBC’s “Meet the Press” that she heard the tape of him using the slur. Q Sarah, what we’ve heard from the President via Twitter, Omarosa, describing her as “crazed,” a “crying lowlife,” a “dog” -- is this any way for a President to talk about any American, let alone somebody that he hired and made the highest-ranking African American woman that served in his White House? MS. SANDERS: Look, I think he’s made, again, the frustrations -- I think all -- not only those of us here in the White House, but frankly, I think most of America would be happy to ignore. Unfortunately, the individuals in this room continue to create a large platform for somebody they know not to have a lot of credibility, for someone they, frankly, refused to give a platform to when they worked here at the White House. I think it would be great if every single person in this room, and every single person in the administration, never had to talk about this again, and we actually got to focus on the real policies and the real things that not matter just to people in this building but certainly all Americans -- African Americans, Hispanics, and everybody in between. I think that would be the best thing that we could certainly do for our country. Q Thank you, Sarah. What do you say to critics who see his attacks on Omarosa as part of a pattern of insulting prominent African Americans, people he’s taken -- criticized recently -- Don Lemon, Maxine Waters. He’s claimed that football players protesting racial injustice don’t know what they’re protesting. MS. SANDERS: Look, the President -- this has absolutely nothing to do with race, and everything to do with the President calling out someone’s lack of integrity. The idea that you would only point a few of the things that the President has said negative about people that are minorities -- the fact is, the President is an equal opportunity person that calls things like he sees it. He always fights fire with fire. And he certainly doesn’t hold back on doing that across the board. Q But have you -- have you asked him directly, Sarah? MS. SANDERS: -- all at one time. MS. SANDERS: I can’t guarantee anything, but I can tell you that the President addressed this question directly. I can tell you that I’ve never heard it. I can also tell you that if myself or the people that are in this building -- serving this country every single day, doing our very best to help people all across this country, and make it better -- if at any point we felt that the President was who some of his critics claim him to be, we certainly wouldn’t be here. When President Obama left, after eight years in office -- eight years in office, he had only created 800 -- or 195,000 jobs for African Americans. President Trump in his first year and a half has already tripled what President Obama did in eight years. Not only did he do that for African Americans but for Hispanics; 1.7 million more Hispanics are working now. This is a President who cares about all Americans, who is committed to helping them, and is putting policies in place that actually do that. Q Thank you, Sarah. Just a very quick one on something that Omarosa said today. She called the President “unfit” -- “mentally unfit” for the office. As someone who worked with her, how surprised are you at the level of her animus toward this President and toward this White House? MS. SANDERS: I’m certainly -- I think like most people that worked with her -- very disappointed that she would go to such a self-serving, and somebody who blatantly cares more about herself than our country, to make up some of these outrageous claims and accusations. Look, she worked here for a year and didn’t have any of these things to say. In fact, everything she said was quite the opposite -- and not just the year that she worked, but the time that she spent on the campaign trail. And I think it’s really sad what she’s doing at this point. Q If I could follow very quickly. I wanted to ask you, just very briefly, we read earlier this afternoon that the Trump campaign has made an arbitration action against Omarosa. And I’m just curious -- and I know they’re separate entities -- but is it likely that the White House is considering pursuing something in the way of possible action toward Omarosa for violating a non-disclosure? Q Sarah, a moment ago, you said one of the motives for Omarosa was to “tear this entire place down.” What do you mean by that? And do you have -- or others here have ongoing concerns that, while she was here, she taped other conversations that could either be damaging to the reputation of this White House or revelatory as something you’d rather keep private? Q One thing that -- one other thing, Sarah. She played a tape recording of a conversation with the President. Do you have any doubt that that is an authentic conversation that she had with the President? Q Okay, then related to that -- the President said he was “unaware” in that conversation. Is that -- was that a truthful representation of what he knew at the time? Or was he just trying to make Omarosa feel better? MS. SANDERS: On the timing, I think is -- he knew that it was certainly a possibility. But as to the fact whether or not General Kelly had called the President, I don’t think he had at that point.